A mounted plaque honors Diamond Terrace contributors. More than 2,000 bricks have been placed - so far! Donors carefully design each inscription to pay tribute to a special call sign. The ARRL Diamond Terrace is a distinctive opportunity to make a permanent mark at ARRL Headquarters in Newington, Connecticut. 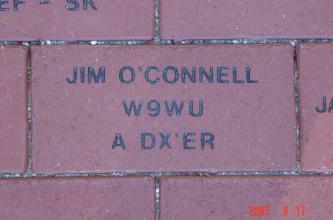 Started in 2007 and prominently located at the entrance to Headquarters, the Diamond Terrace is composed of inscribed bricks placed by committed ARRL Diamond Club members. The Diamond Terrace recognizes donors who wish to honor their own call sign or the call sign of a special family member, Elmer, club or Silent Key. Amateur Radio organizations are welcome to participate to honor accomplishments and memorable occasions. 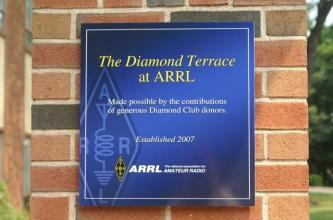 The Diamond Terrace at ARRL is part of the annual giving program, The ARRL Diamond Club, that invites annual contributions to provide financial support for programs not supported by member dues. Enrollment in the Diamond Club includes all the benefits of ARRL membership including the popular ARRL monthly magazine, QST. Join the ARRL Diamond Club today at the Brass level or higher, and you will be entitled to place a brick in the Diamond Terrace. Specially designed certificates representing the inscription on your brick are available upon request. Lucite brick replicas are also available for an additional charge of $21.95. SPECIAL NOTE FOR MEMORIAL GIFTS: Individuals or clubs that wish to place a brick in the Diamond Terrace as a memorial to a Silent Key or to honor a friend or family member, may make a one-time donation of $250. Please complete the ARRL Donation Form and use the Diamond Terrace Brick Inscription Form to provide information for the brick inscription.